Place eggs into a medium saucepan and cover with water. Bring to a boil and leave for 8 minutes and then immediately remove the eggs and into an ice bath. Wait a few minutes. To peel: After the eggs have been in the ice bath for a few minutes, lightly tap them on your countertop or a hard surface and peel gently under cold running water. Chop up hard boiled eggs and place into a mixing bowl. Add in the mayonnaise and dijon mustard; amount depending on how creamy you want your egg salad. Start with one tablespoon each. Mix together, taste and adjust ingredients as needed. Sprinkle on some smoked paprika if desired. Set aside. If desired, spread some mayonnaise and dijon mustard on the sliced bread. 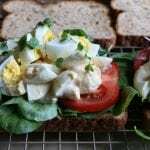 Lay down the fresh spinach and tomato slices and top with some egg salad and micro greens. Top with other slice of bread and enjoy!